to expand the community of lawyers who are exploring alternatives to the adversarial, anti-therapeutic system. In 2008, I gave up my house and office to travel full-time in service of my mission. 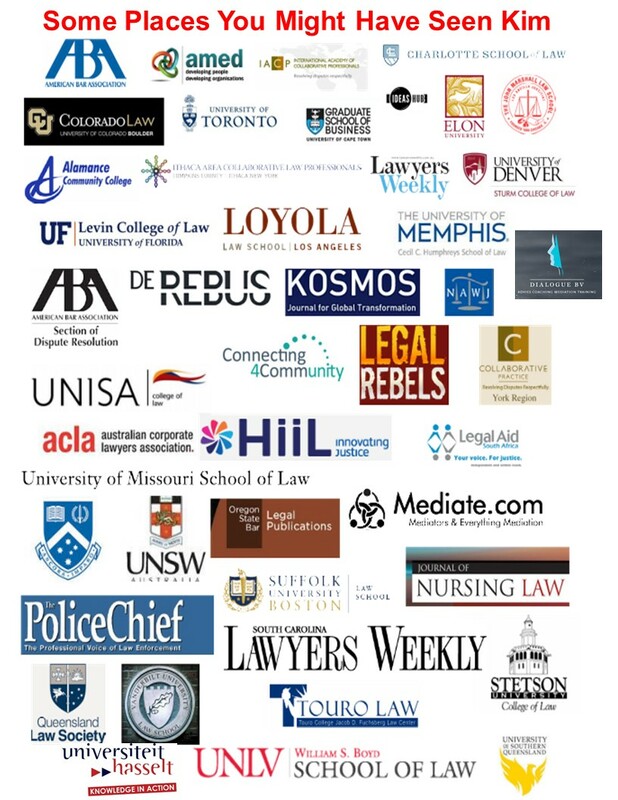 I travel from assignment to assignment, advocating and educating about the integrative law movement. Typically, when I go to a place, I try to do several kinds of events. Participants often say that they’ve dreamed of hearing stories like the ones I tell. Even when I do academic lectures, my topics are exciting enough to invoke active discussions, both pro and con. I often have several one-on-one coffee/tea/lunch dates with influential people who may be too busy, too skeptical, or too shy to come to group gatherings. I love group gatherings with kindred spirits. Informal gatherings offer a chance for people to see that they are not alone. These can be in a private home, the meeting room of a cafe, or occasionally in a park on a nice day. Sometimes the invitation is to come and listen to me, to learn. I will talk a little bit, but generally just enough to set the tone and to give permission to bring one’s whole self to the room. I will tell some stories that will open the field of safe conversation, then I generally hold the space for everyone else to talk, to share ideas they haven’t said aloud in a group of lawyers before. Sometimes I have some specific questions to encourage discussion. Often I hold a circle, so everyone has a chance to be heard. I am also a facilitator for the Legal Changemakers’ Cafés. 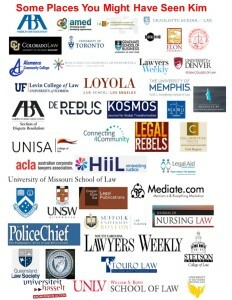 I hold guest lectures at law schools and universities. I visit classrooms or hold lunch meetings. We often invite local lawyers who will support the idea that we’re not so weird (or if we are, it is okay to be). Business schools are also very interested in what I have to say about where consciousness in law and business intersect. My work provides an excellent case study for Organizational Development or Social Change students, since I’ve used OD tools to work on the legal profession. Media often interview me when I am in a city. I’ve been featured on many radio shows, television, newspapers, and magazines. Media coverage helps to normalize our movement. Having the attention of someone from out of town adds credibility to local lawyers and projects. I offer one-on-one or very small gatherings of intensive coaching and exploration for sole practitioners or small firms. I am able to also consult with court programs, larger law firms, and change-makers who are grappling with seemingly intractable, systemic problems. I bring all my OD, Social Change, Transformational Technologies skills and training to highest use. Generally, I put together trips with a combination of sponsors. I keep expenses low. I am good at shopping for the lowest airfares and I commonly stay with people, saving the hotel bill. I am neither a rich person nor the recipient of regular corporate sponsorship. When a gap in finances occurred, in the past, I have just pulled out my credit card to make up the difference. All my income from coaching and other resources went into subsidizing outreach. Even small honorariums support my continued work.